It is reported that Mahatma Gandi passed briefly through Dundee. We have been told he was trialled at the Magistrate’s court and locked away for a night in the local town prison.This morning we attempted to seek out the cell. There is dispute over whether this building still stands at all. How, we wonder, are insignificant and everyday places granted historic/ universal significance by the legends that pass through them. How are such moments remembered and what record, if any, remains in this cell to mark the Mahatma’s uncongenial stay. Warrant Officer Singh, from the local police station, holds the keys to the contested room and kindly shows us around. On entering, she points to an obscure mark on the concrete floor. This, she tells us, is the place where leg-irons were once cemented. We study the crack with reverence, possibly the point where shackles once clasped Gandhi’s ankle. Our eyes shift from the floor to metal cabinets filling the room. 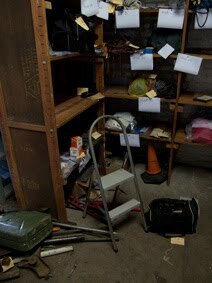 An odd collection of objects cluttering each shelf: golf clubs, a jerry can, a weed eater, car battery, shoes, machetes, a traffic cone, rat poison, an extension cord and a variety of crow bars. Each implement tied with a string and yellow tag.“What are these for?” we ask Officer Singh.She surveys the installation gloomily. “ Murder weapons.” she confesses grimly. Our point of reflection transfers swiftly from the incarceration of an icon to just how creative people can get when it comes down to offing one another. Not the museum the Mahatma might have hoped for. 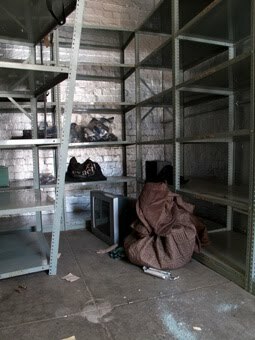 The local Dundee police station obviously needs’s all the office space it can get.